The Metal Sonic rival battle in Sonic Generations takes place where you first fought the metal doppelganger in Sonic CD, Stardust Speedway. 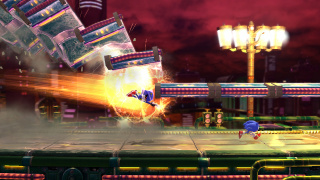 The fight takes place in the Bad Future of the zone, the one under Eggman's control. Charging you with a corkscrew spin. To avoid, keep to the right. Shooting down a charged shot at you. Stay to the left, but don't go too far. Hitting structures off the side onto the track. Watch the shadows and move away from them. Every time he does an attack, he shorts out for a couple seconds, giving you a chance to attack him. When he is close to death, Metal will do a super fast corkscrew spin charge at you, which will last longer than his normal one. If you can dodge that and hit him again, you will destroy the impostor and earn a Chaos Emerald.